The Manager of UEW Co –operative Credit Union, Mrs. Christina Kilson remarked that the Credit Union in today’s era is faced with a lot of challenges especially with the collapse of Micro finance institutions and has resulted in the inability of the Union to attract new members. This has also changed members expectations and demands. 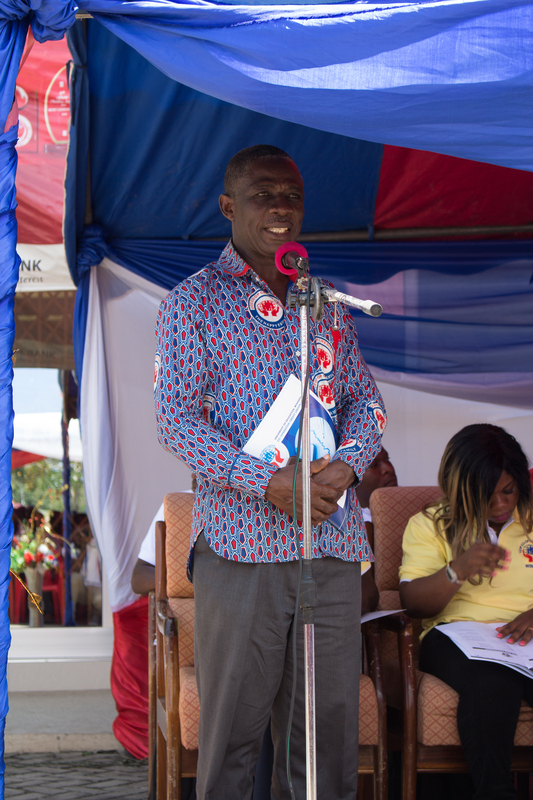 The Dean, Faculty of Science Education, Prof. Asiedu Addo, in a speech read on behalf of the Vice-Chancellor of the University of Education, Winneba, said the “UEW Credit Union needs to be commended for fulfilling a major direct objective of welfare associations, which is to cater for the varied needs of its membership”. He noted with pride the innovations by the successive Board of Directors in their frantic efforts to introduce I.C.T in the operations of the Union, such as SMS Banking, creation of a website, networking infrastructure that links the Kumasi office to the Winneba office and the EasyBank software. Additionally, there was a request for space to provide similar services at Kumasi Campus. All these were to improve upon the quality of service for its members. He pointed out several efforts by the UEW to financially support its staff in varying degrees and levels since the inception of the University like the popular car, furniture and GUSS loans as well as workers schemes by FUSSAG, GAUA and TEWU to assist members. He commended the Credit Union in helping the University in the herculean task of meeting the welfare needs of staff. He said that the management of UEW is ready to support the newly elected Board of Directors in achieving the spelt-out vision and mission of the Credit Union. Prof. Aseidu Addo in his concluding remarks stated that the members play a central role in the growth of the Credit Union as the more the members the stronger the Credit Union. He encouraged more staff to join the Credit Union and existing members to increase their shares and savings as investments. The General Manager of Ghana Co-operative Credit Unions Associations Ltd (CUA) in his keynote address said the Credit Union is classified as Class “A” Credit Union in the country. He added that the secret to financial freedom is savings and therefore encouraged the members of the Credit union to save more and withdraw less from their savings. He urged members to cultivate the habit of saving a percentage of their earnings to secure their future. He said that people associate happiness with spending, but spending is good and should be done wisely without any negative effects. He therefore urged all members to plan, save and spend wisely. He emphasized that the Union belong to all class of people; both the poor and the rich and does not discriminate. He urged members to plan and set goals in order to prepare for their retirement. ‘When you spend unnecessarily it affects your future and Credit Union is there to help you not to spend unnecessarily’. How much you earn is not important but how much you save. The outgoing Chairman of the Board of Directors, Mr. Andy Y. Agordah, in his report made known the activities of the Credit Union from their last AGM held on September 25, 2015. In his report, he said the membership of the Credit Union has increased from 1,815 members to 2,302 in 2016 representing 27% which manifested in the rise in savings up to 63%. He again added that as part of the social responsibilities of the Union, it donated a 32 inch LED Samsung television plus GHC 500.00 for a banner to the Efutu Municipal Assembly, it also printed and donated 2000 custom made exercise books and GHC 240 to Ghana Education Service as part of the Girls’ Education Support as well as GHC 300 towards CEO breakfast meeting to discuss the social and economic problems of the Central Region. The new Board of Directors was introduced to members by Mr. P. V. Mensah after the dissolution of the old Board of Directors to pave way for the new Board to serve the Union for the next two years. The new Chairman of the board, Mr. Steve van Kamassah, speaking on behalf of the newly elected Board of Directors promised to work with his board members to lift the Union to higher standards as expected of them.